Horns Rev 3 is a new offshore wind farm proposed to be built by Swedish state-owned energy company, Vattenfall Vindkraft. Image: courtesy of MHI Vestas Offshore Wind. The 400MW wind farm is expected to provide power to approximately 450,000 households in Denmark. Image: courtesy of Vattenfall. The wind farm will be equipped with MHI Vestas V164- 8MW turbines. Image: courtesy of Heidi Lundsgaard. Horns Rev 3 is a 400MW offshore wind farm proposed to be built off the west coast of Denmark by Swedish state-owned energy company, Vattenfall Vindkraft. The wind farm is expected to supply power to approximately 450,000 Danish households. Horns Rev 3 will become Denmark’s biggest offshore wind farm when commissioned in 2017. The renewable power project is also anticipated to produce the world’s cheapest offshore wind power. It will generate 7,000 jobs during construction, according to the Danish Ministry of Finance. The wind farm will be located in the eastern North Sea, approximately 20km to 30km off the northwest coast of Denmark. It will lie in a shallow area north of Horns Rev, at water depths ranging between 10m and 20m. The region enjoys a windy climate throughout the year. The project will be situated in close proximity to the existing Horns Rev 2 offshore wind farm. 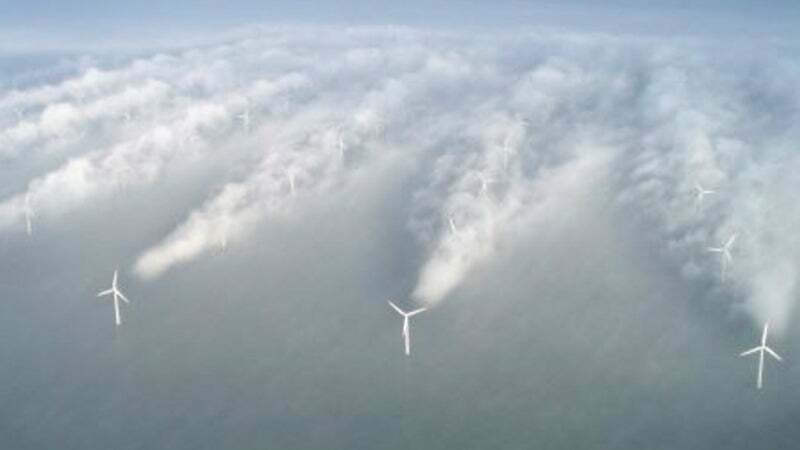 The contract notice for the Horns Rev 3 wind farm was published by the Danish Energy Agency in December 2013. Vattenfall won the concession to construct and operate the wind farm in February 2015. The final investment decision for the project was made by Vattenfall in June 2016. As per the concession agreement signed between Vattenfall and the Danish government, the wind farm will have to be fully-operational by January 2020. "The renewable power project is also anticipated to produce the world’s cheapest offshore wind power." The wind farm will be equipped with 49 V164- 8MW turbines from MHI Vestas Offshore Wind. The turbines will comprise of 80m-long blades weighing 35t each and covering a swept area of 21.12m². The 105m-high turbines will have a height of 187m to blade tip. The nacelle of the turbine will be 20m-long, 8m-wide and 8m-high, and will weigh approximately 390t. The turbines will start power generation when wind speed at hub height is between 3m/s and 5m/s and higher wind speeds will enable turbines to achieve maximum power output. The turbines will be programmed to shut down automatically in case of wind speed above 25m/s. Each wind turbine will include tubular towers and three blades attached to a nacelle, which houses generator, gearbox and other operating equipment. The foundations of steel turbines will be coated with protective paint and installed with sacrificial anodes in order to prevent corrosion. The power generated from the wind turbines will be transmitted to an offshore substation through inter array cables, where the voltage will be stepped up to 220kV by transformer platforms. The power will then be transferred from the substation to a store point at Houstrup Beach, through a 220kV export cable. Another substation will be built in Blåbjerg dune plantation to connect with the grid. Additionally, a 220kV cable will be laid for transferring power to an existing substation in Endrup to feed the power into the electrical transmission network. The project will also involve the installation of 400kV power lines on towers between Endrup and the Revsing substation. A 150kV connection will be placed underground between Endrup and Holsted. Sweco Architects conducted the environmental study to assess the impacts of the offshore wind farm on the environment. Lloyd’s Register will work in collaboration with Energinet.dk to determine the measures needed to curb the noise generated by the turbines at sea in order to protect the marine life. The collaboration will also be responsible for the grid connection installations. Energinet.dk awarded a contract to ABB and Prysmian Group for the supply of 245kV HVAC power cable connection including 45km of land cable route. The group will also connect the wind farm substation to the transmission station at Endrup. Blue Water shipping is responsible for the transportation and storage of the transformer units. AAF supplies a range of gas turbine equipment and filters and can carry out repairs, refurbishments and upgrades on gas-powered power plants.